Food trends are endlessly fascinating to me. The Tunnel of Fudge Cake was a Pillsbury Bake Off Winner in 1966. This is a chocolate cake with a molten center of fudge. Sound familiar? In the mid 1980s, molten chocolate cake became a staple on every dessert menu. Items somehow surface, peak and slowly fade. Some fade forever (fondue, anyone? ), others just become menu staples, like calamari or spinach artichoke dip. The New York Times did an excellent article on the trend of food trends. Of course, being the New York Times, they insisted the most trends start off in metropolitan cities and then spread elsewhere. If you take the time to read the article and are from Maryland or Louisiana, you will laugh out loud at the idea that crab cakes originated in a metropolitan area. 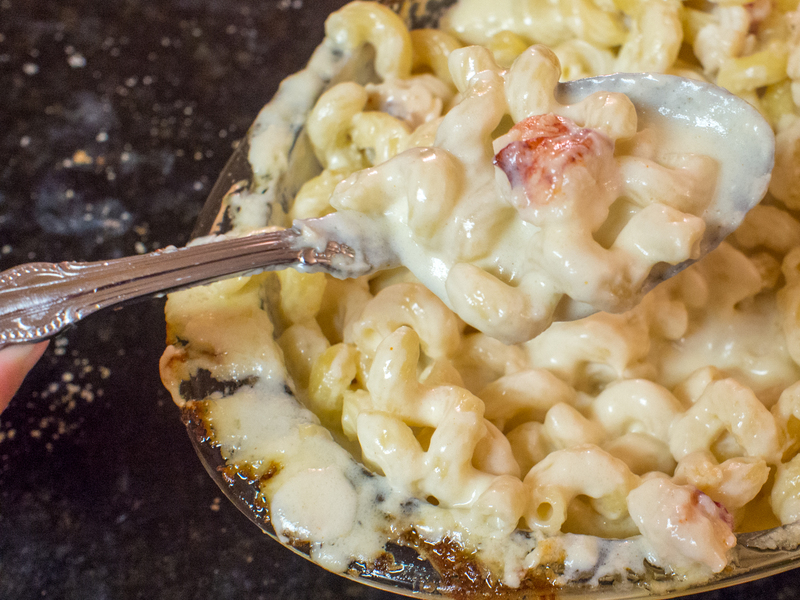 I mention food trends because somewhere along the way “lobster mac and cheese” became a thing. I find this combination of lobster, pasta and cheese sauce odd. One, it’s lobster. Lobster is awesome. Lobster is perfection with melted, clarified butter. Why mess with this exquisitely simple recipe? Two, in this era of low carb, gluten free anything, how is this dish even surviving, much less thriving? From a restaurant’s point of view, I see the appeal. Charge a premium for mostly a pasta dish with a few chunks of lobster with a cheese sauce. I regularly see this dish around $20 and marvel at the price of something that is essentially a $2 box of pasta with a few nuggets of lobster and a bechamel sauce. I’ve tried various incarnations of the dish, as others of my party have ordered it. Mostly, I seem to miss the “lobster” of the dish. I taste the cheese and the pasta, but little in the way of lobster. I would imagine this result explains the general food rule of no cheese with seafood. The cheese just overwhelms the delicate lobster. I got to thinking about this dish when I was selected to promote Castello Aged Havarti Cheese. Honestly, when I got this cheese, I really just wanted to eat it as is. The cheese is really good and has these really interesting crystals dispersed throughout that occur due to aging. If you look really closely, you can see small sparkles in the cheese. I’m not professional cheese tester. Really. But here’s what I love about this cheese, it’s got real depth. It’s not one dimensional. Also, the Havarti melts superbly. I know this because we’ve used it to stuff jalapenos and make awesome grilled cheese sandwiches. Plus, it’s a well known fondue cheese. After tasting the cheese, I decided that it just might be the perfect cheese for lobster mac and cheese. Creating a recipe with the internet is a bit overwhelming. You are inundated with ideas. Chefs want to make things so complicated. It can feel like a conspiracy designed to keep people from cooking. Make easy things ridiculously complicated and discourage people from trying. In the alternative, you just have some rather, um, interesting ideas. Why would anyone add Chipotle to lobster mac and cheese? Why bother putting lobster in the dish if you add that strong spice? Or bacon? Again, lobster isn’t really supposed to have competition. So, I got my inspiration from one of my favorite lobster dishes: lobster bisque. Velvety smooth, rich, creamy and most of all, lobster-y. This dish is everything you want in comfort food: rich, thick and sinful. It combines the best of lobster bisque and macaroni and cheese. You will not be disappointed! Note: To make the lobster broth, save the lobster shells and simmer them in water as you are making the pasta. Super easy, but key to this dish. Without this touch of broth, the lobster taste can be overwhelmed by the rich and cheesy sauce. Heat oven to 375° fahrenheit. Spray 9×13″ baking pan with cooking spray, set aside. Cook pasta in salted, boiling water for half of the recommended cooking time (about 3 minutes). Drain and set aside. 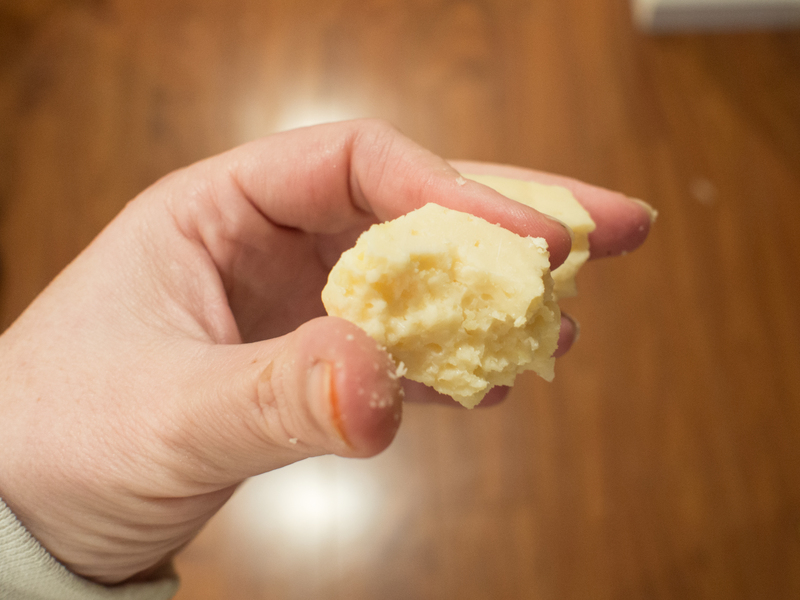 Melt butter in a heavy bottomed, 4 quart saucepan over medium heat. Add flour and whisk constantly until smooth. Add milk, and whisk often, until sauce has thickened and coats the back of a spoon. About 10 minutes. Remove pan from heat and stir in 2 cups Castello Aged Havarti, along with the mascarpone, broth, sherry, hot sauce, and nutmeg. Adjust seasoning as needed with salt and pepper. Add reserved pasta to cheese sauce. Stir in half of the lobster. 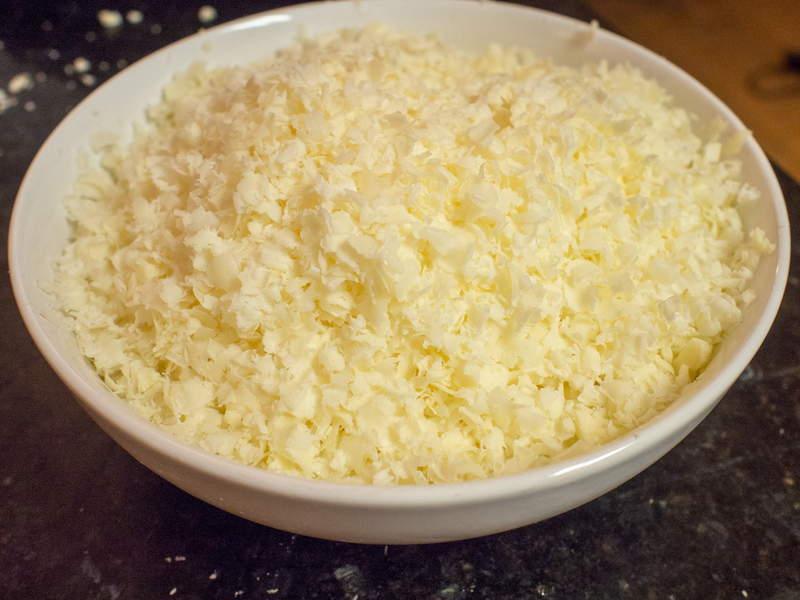 Pour mixture to the 9″ x 13″ baking dish and sprinkle with remaining Havarti. Bake until golden brown and bubbly, about 30 minutes. Let cool for 10 minutes. Garnish with remaining lobster. Inspired by a recipe found in Saveur. This entry was posted in Main Dishes, Seafood and tagged castello aged havarti, easy, Lobster, mac and cheese, macaroni and cheese on December 16, 2014 by dawn of food. We have a small football pool in our house. We pick for winners only. The winner of the weekly pool gets to pick either a special dinner or a special dessert. My kids, being rather awesome. They “saved” their wins and pooled them so they got a special dinner and dessert on the same night. Now, my kids don’t eat the same, at all. I never thought in a million years they would agree on anything dinner-wise. So, imagine my surprise when they did. Want to guess what they picked? Lobster. Yup. One’s never had it, but wanted to try it. The other one has had it once. At the same time, I haven’t really done a historical recipe for a while. So, the first one that came to mind was Lobster Newburg (or Newberg). What’s not to love? Lobster, cream, sherry, some kind of wonderful bread. Sheer Nirvana. I could eat a sherry cream sauce everyday. Love it. But, the kids didn’t want a “recipe”, they wanted plain lobster with butter. 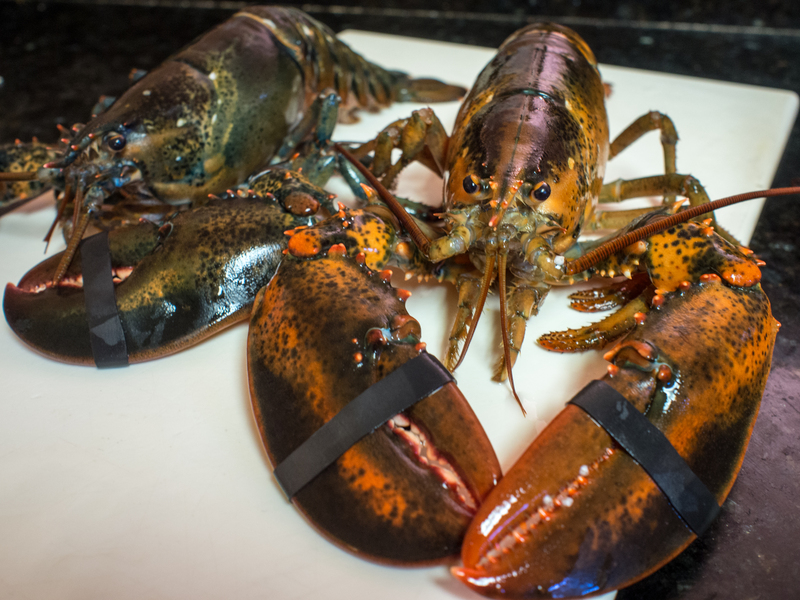 So, two of the lobsters were steamed “plain” and two were turned into Newburg. For dessert, they requested a banana split. Odd pairing, but given it’s ease to make, I’ll take it!! 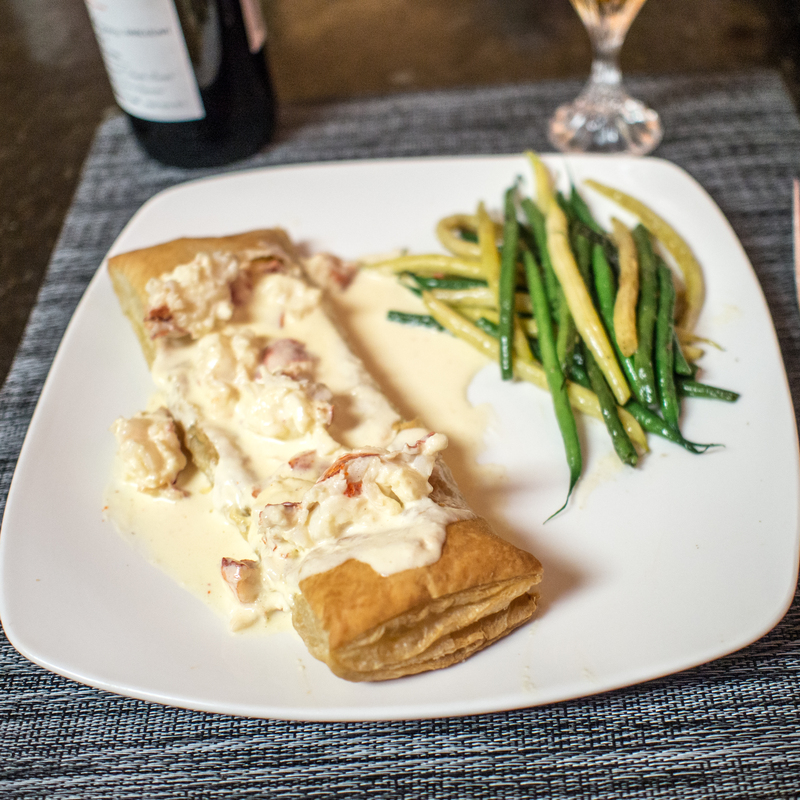 Lobster Newburg has a fascinating story, depending on which one you believe, if any of them. The dish originated in the late 1800s in America, believe it or not! All renditions of the origin story are tied to Delmonico’s, a very famous restaurant in New York City at the time. One version has a French chef departing Delmonico’s to open an inn in Pennsylvania. He wanted to serve very continental cuisine and came up with Lobster Newberg to serve at the Hotel Fauchere in Millford, Pennsylvania. The traditional story is a bit more colorful. Ben Wenburg was an avid traveler, successful businessman, and reliably regular customer at Delmonico’s. To boot, he was a favorite diner of Delmonico’s owner, Charles Delmonico. One version has Ben swooping in and, with great showmanship, making his new favorite dish over a chafing dish in the middle of the dining room and serving it to Delmonico. Delmonico loved the dish and added it to the menu, naming it Lobster Wenburg. Delmonico and Wenburg subsequently had a falling out and the item was removed from the menu. However, as it’s delicious, there was a great cry to bring it back. So, the Delmonico transposed the W and the N and renaming Lobster “Newburg”. Other versions have the Delmonico naming the dish in honor of Wenburg, and Wenburg politely declining to have his name on the menu. Wenburg then suggests the N and W swap to disguise his name. No matter what the story, the dish was an amazing success. When you see how simple this is, you will be amazed. It is an awesome romantic dinner. You know, when the kids are eating their steamed lobsters next to you and everything. Ah, romance. Preheat oven to 400 degrees Fahrenheit. Place pastry on a baking sheet lined with parchment paper or a silicone baking sheet. Bake for 15-20 minutes until the pastry has risen and is golden. While the pastry is cooking, turn your attention to the sauce. Ok, you may want to use a double boiler if you are skittish about heating a high fat milk product, but if you promise to use a heavy bottomed pan and cook the cream over medium low heat, you may be fine. I was. I hate using a double boiler, too many pans! Slowly heat the cream in a larger sauce pan, stirring frequently, but don’t let it boil. When it is moderately hot (like hot chocolate hot), temper the egg yolks (add a tiny bit of the hot cream to the yolks incrementally until the yolks are rather warm), and add the yolks back to the cream. Return the pan to the heat and allow to simmer gently, again with frequent stirring. Add the lobster to the pan and continue to cook until the lobster is warmed through, about 5 minutes. Add the butter and sherry and stir until the butter is melted, about 1 minute. 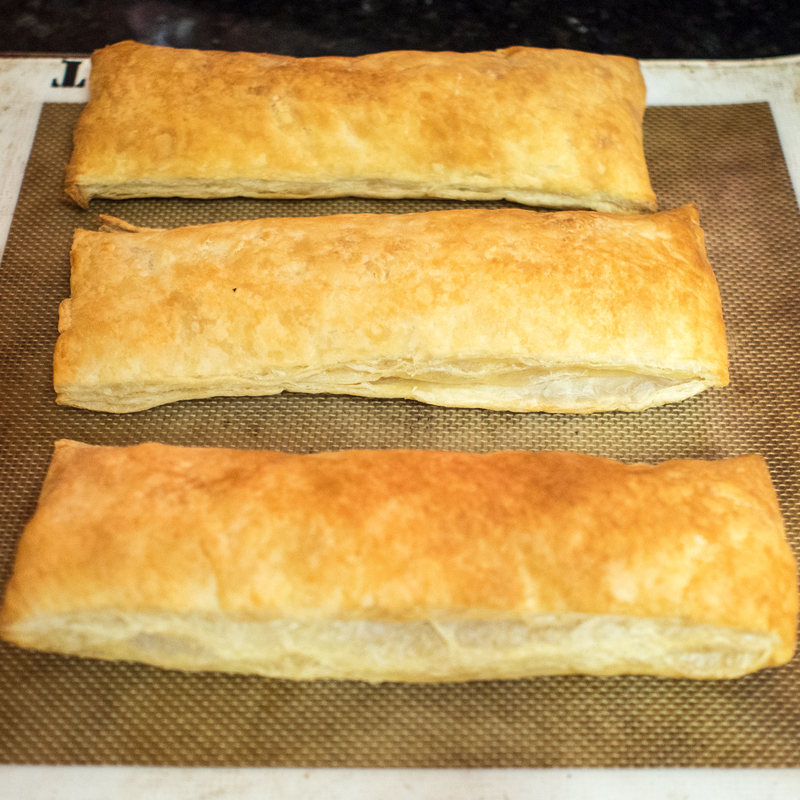 Serve over puff pastry (can also use rice or toast made from great French bread). *You can have your market steam your lobster. 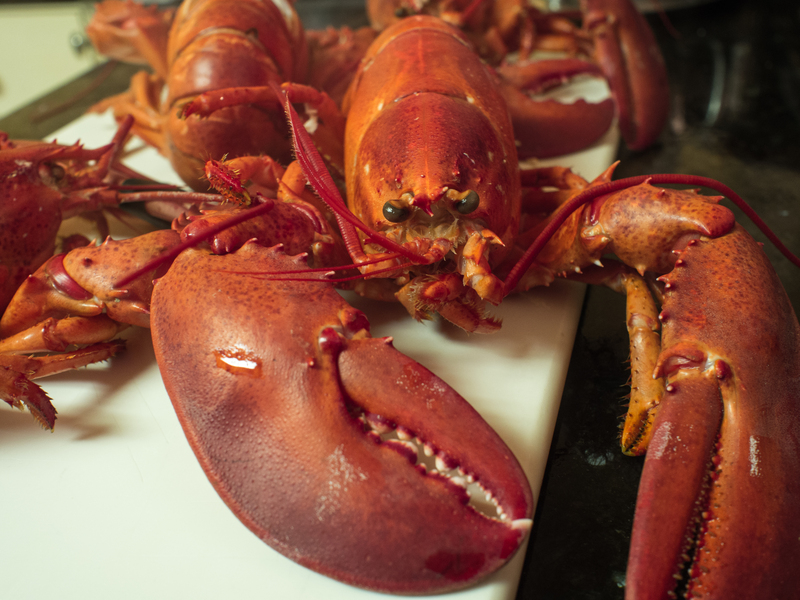 You can boil the lobster yourself in a deep kettle of boiling water for 5 minutes for the first pound, and 3 minutes for each additional pound until the lobsters are done. You can steam the lobsters until they are a bright red. However you cook your lobsters, you just need to shell them afterwards. As a Marylander and a voracious crab eater, picking lobsters is a walk in the park compared to crabs. This step should not be a deterrent!! This entry was posted in Main Dishes, Seafood and tagged Lobster, Lobster Newberg, Lobster Newburg, Shellfish on October 16, 2013 by dawn of food.